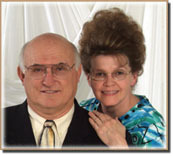 Sr. Pastor/Apostle Larry T. Smith and his wife Judy came to El Campo as Pastor in 1985. Pastor Smith has an awesomely indepth ministry in teaching and preaching God's Word. He formulated the Two-Day Bible Study entitled Rightly Dividing the Word, which has helped untold thousands of believers come to a solid foundation in the Word of God. He has traveled to several foreign countries and is well known for his prophecy teachings in the field of Kingdom Eschatology. Pastor Smith has also founded the Rightly Dividing The Word web ministry which offers one of the best selection of prophecy books and teachings on the internet. Bro. Smith is mentor and apostle to many ministers across the country. He has a vision and message that affects the Church worldwide, and believes and preaches a truly Apostolic government structure in the Church.